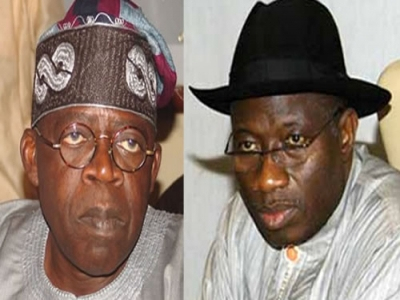 A national leader of the All Progressives Congress (APC) and former Lagos State Governor, Senator Bola Tinubu has renewed his verbal attacks at President Goodluck Jonathan, describing his administration as a failure. According to the APC chieftain, the President’s incessant excuses to Nigerians is testament to his inability to continue to preside over the affairs of the nation and urged him to resign. Tinubu made the remarks on Friday, in Benin City, while commissioning the new six lane New Lagos Road and the Ewohimi Hospital in Esan South East of Edo State. He said: “A nation fails because of the leadership failures, if there is a good leader at the top, a nation will not fail. Because the fish start getting rotten from the head. The poverty, insecurity, unemployment which we are witnessing today in this country is because the head has failed. “Let them stop giving us excuses that Boko Haram is in my government, fish them out. That we have saboteurs in the military, you are admitting failure. No excuse of failure, Mr President we chose you to lead this country, resign if you cannot enough of the excuses”. Tinubu, who described Governor Adams Oshiomhole as a man of honour and one capable of leading Nigeria, pointed out that the governor’s developmental strides in Edo state is an indication that the APC has a reservoir of credible people capable of becoming president. “Many people like you would have fell into the temptation of naira and kobo. But you stood for the progress of Edo state. We share in common the determination to make progress, you had the opportunity to be in labour party, you had that option clearly, but you chose to be with the progressives that you know”, Tinubu added. Whatever,,,,,, all we need is change!!! Today he is good, tomorrow he will be declared bad. whatever ! Total change will occur coming 2015 : GMB for president ! Everyone is saying all what Mr. Tinubu is saying is correct by painting the Mr. President black what did he do as a Governor and Senator to make life better for the masses. Let it be known to you the problem of Nigeria will continue to increase instead of decreasing because nobody wants to work with the president to make things better for the people.